I love kale. I could eat kale morning, noon, and night every single day and never get bored. One of my favorite ways to eat kale is in a raw kale salad like this one. I know, it sounds really vegan—raw, kale, salad, I get it. But the kale in this salad has been lovingly massaged with a bright and tangy dressing that’s packed full of anti-inflammatory goodness. Beyond that, this kale salad merely tastes good. So, why massage kale? Well, kale is a robust leafy green. Massaging the kale helps to break down the dense, chewy cellulose (plant fiber) in the kale, which makes it more easy to digest. Digestion begins in your mouth, right? Raw kale has a very tough texture which takes a lot of chewing on our part before we can swallow it. Think of it like this: Massaging kale before eating is like pre-digesting it. If you’ve never massaged kale before, don’t worry it’s not hard. Simply massage washed and trimmed kale leaves with fat or acid for about 3-5 minutes. The kale will visually change as you massage it; the leaves will start to wilt and become more vibrant in color. Plus, I like that rubbing them makes the leaves silky and easier to chew. 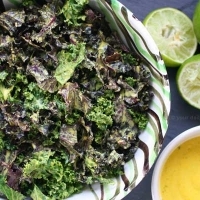 This massaged kale salad features a tangy, bright yellow tahini dressing that is made with the powerhouse spice, turmeric. Turmeric contains essential vitamins and minerals including manganese, iron, vitamin B6, potassium. According to Dr. Michael Greger at NutritionFacts.org, turmeric also carries a host of other health benefits too like; fighting inflammation, relieving symptoms of depression and rheumatoid arthritis, and even may prevent and kill some types of cancer cells. The health benefits get even better when you consider the nutritional makeup of kale as well. Combined, you get a double dose of good-for-you nutrients. All of that is excellent news because we can all use more food that is as tasty as it is healthy. Right? Right. 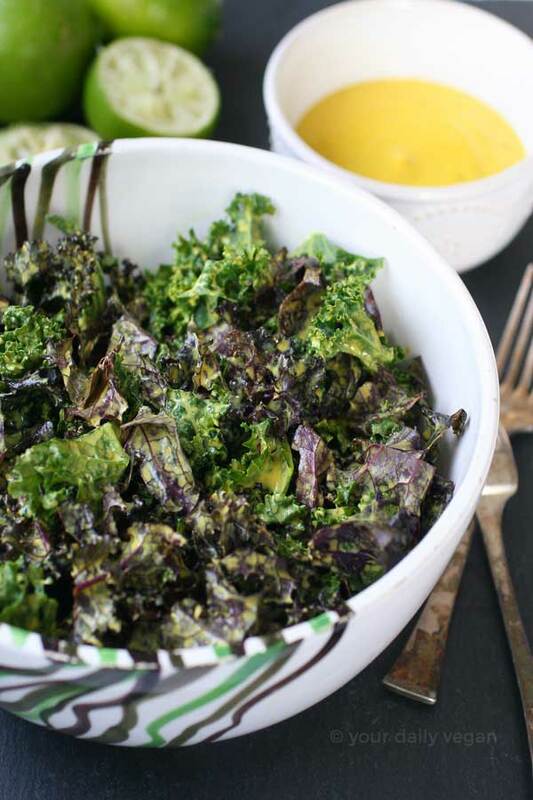 A healthy massaged kale salad featuring a bright and tangy dressing. Wash and trim stems from kale leaves. Cut into bite size pieces and place in a large bowl. Drizzle 1 tablespoon of lime juice over the leaves and massage until tender, about 3 - 5 minutes. Set aside. Place tahini to a small bowl and add lime juice. Using a whisk and moving slowly, whisk in the lime juice. The tahini will become very thick and turn a lighter color as you mix. Once the mix is too thick to continue, drizzle in a tiny amount of water to smooth it out. Continue this process until you get a smooth free-flowing dressing. Generally speaking, I use approximately 1/4 cup of water. Be careful not to add too much water as it can water down the dressing- only use the amount of water you need to get the consistency you prefer. Add spices to the tahini dressing. Whisk until the spices are fully incorporated. 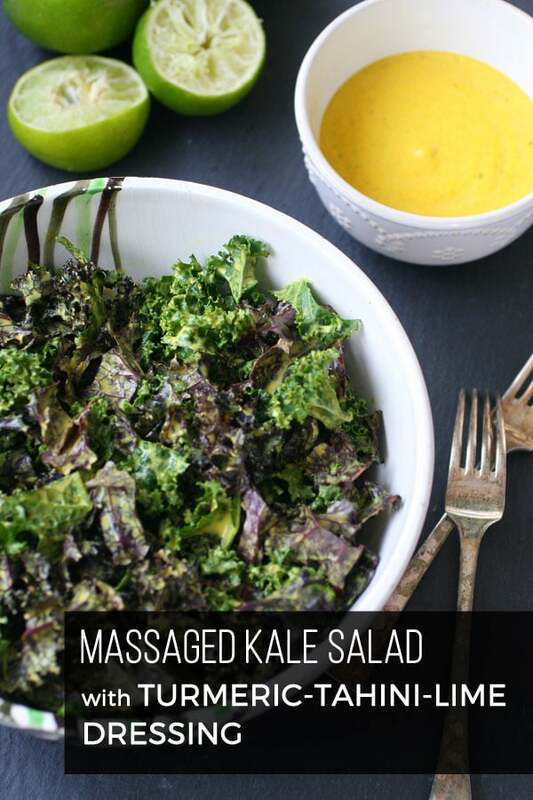 Pour dressing over massaged kale. Using tongs, mix until fully combined. Regardless of what form of turmeric you choose to use, fresh or powdered, it will stain everything it touches a bright yellow color. It’s the reason I use it in my homemade natural food colorings. 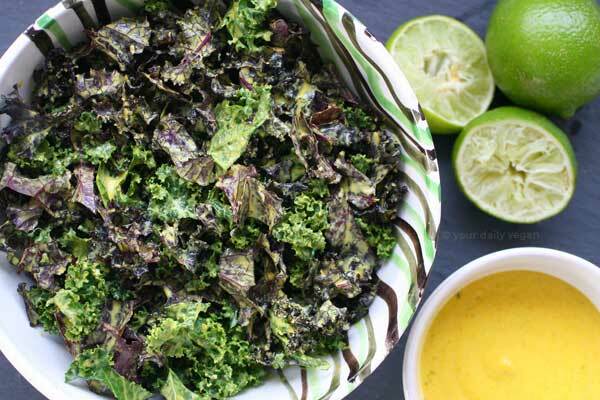 You can avoid staining your hands yellow by wearing protective kitchen gloves when massaging the kale. Nom, nom, nom! This looks amazing! Much love for your blog. This looks delicious! As a main dish, how many would you say this serves? Hi Tracey! If I was going to serve this as a main dish, I would add some vegan protein to make the salad more hearty. Beans, cubed pan-fried tofu, or even tempeh would make a great addition to the salad. Chickpeas (roasted perhaps) would be particularly fantastic. I’d say that this salad could easily serve 4 people, though it depends a little on how big the bunches of kale you find are and how much people like kale :) If you make it (and I hope that you do) let me know how it goes!